In audio circles, the name Neumann will always be associated with microphones. Georg Neumann and the company he founded have done more than anyone else to perfect and to popularise the capacitor microphone, and it would be a brave commercial studio that tried to attract paying clients without having some Neumann classics in its mic locker. After all, it is widely and rightly recognised that the microphone is the most important part of the recording chain. However, if there's one other part that rivals the microphone in significance, it's the monitoring system. No self‑respecting studio can afford to skimp in this area either, and in 2005, Neumann's parent company Sennheiser acquired German loudspeaker manufacturers Klein+Hummel. Four years later, the studio monitor arm of K+H was folded into the Neumann stable, and since then, there have been numerous loudspeaker releases under the Neumann brand. These have built on K+H's already strong reputation to develop a very highly regarded product portfolio. 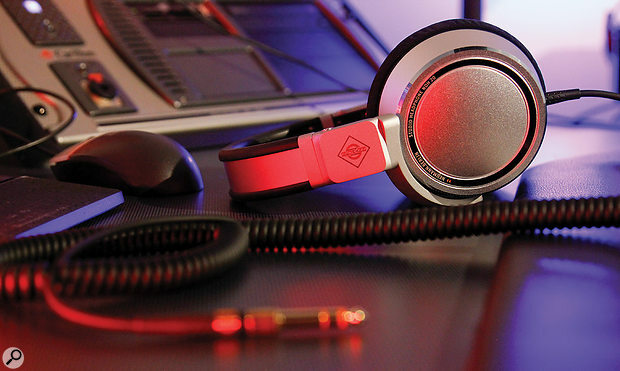 Sennheiser themselves, of course, are also well known both for microphones and headphones, but until this year, the Neumann brand has never encompassed headphones. That has changed with the launch of the NDH 20. Neumann has always been a premium brand, and their first headphones occupy a market niche that Sennheiser's range does not currently cater to. The NDH 20s are closed-back, over-ear, moving‑coil headphones that are intended to balance the sound quality necessary for critical listening duties against other factors that are important in a studio context, such as comfort, isolation and ease of maintenance. Price-wise, they sit well above Sennheiser's studio-focused models, such as the HD 380 and HD 598, but well below the flagship HD 820, targeted primarily at audiophiles. Sennheiser UK +44 (0)1628 402200. Sennheiser US +1 860 434 9190.